Her knowledge and understanding of horses and people is based on her formal education as educator and on her longtime work with mentor and teacher Richard Hinrichs. She is now living in France and working with her husband Philippe Karl, former trainer at the French national School of Legetere (Lightness). Bea has developed her large repertoire of circus lessons based on her own insight and experience. And she shows how these exercises can successfully be applied to the general training of the horse. 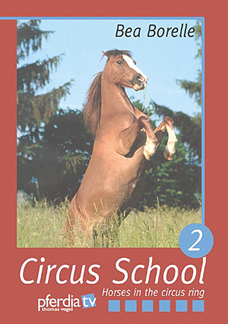 Circus exercises are fun and they pep up horse's everyday life. In the first part of this series, Bea Borelle demonstrates basic exercises and circus lessons with different obstacles. In the second part of this series Bea Borelle shows how horses learn funny and classic circus exercises full of enthusiasm. She presents high school exercises with her amazing star pony Ben. 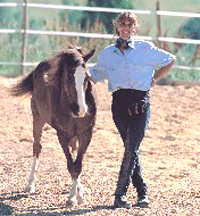 Bea Borelle is a committed and engaged trainer and well-known among horse people. Her pony Ben is the darling of the public and the star at countless trade shows. 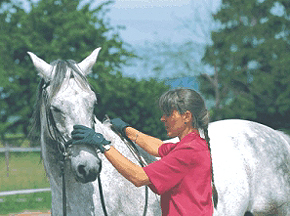 Bea Borelle's circus workshops and clinics for ground work, riding and training horses are very popular all over Europe. Volume 1: Basis exercises and tricks: leading, free standing, rein back, rewards, rattling sack, umbrella, watering can, fluttery curtain, platform. 49 minute DVD. $39.95 plus s/h. 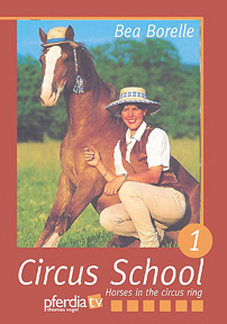 Volume 2: Classic circus exercises and show ideas: seesaw, bringing out the carpet, nudging, bowing, compliment, laying down, sitting, free dressage exercises and at the long reins. 44 minute DVD. $39.95 plus s/h.